Rooms 12 (5 suites, 4 double, 2 family rooms, 1 wheelchair friendly; all en-suite, 1 shower only). B&B from €80 pps Seats 80; D Wed-Sat 6.30pm-9.30pm, L Sun only 1pm-4pm. Early D Wed-Fri 6.30pm-7.30pm, from €35; Set D from €60, Sun L €35. House wine about €20. Children welcome; reservations advised. Restaurant closed Mon, Tue. Full wheelchair access. Parking. No pets. Weddings. House closed 1st week Nov, 3 days Christmas. Amex, MasterCard, Visa. THINGS TO DO IN LONGFORD Walking : The Royal Canal stretch from Longford town to Clondra offers a multi activity path for walkers and cyclists. Wonderful trails and walkways include forest walks at Newcastle Woods, Derrycasson Woods and Lanesborough North Commons. Sightseeing: Granard Motte, Lough Ree, Saints Island, Barley Harbour, Lough Gowna. Villages of Ardagh, Newtowncashel and Abbeyshrule - award winning villages. Visitors Attractions: Corlea Trackway Centre, Kenagh, Strokestown House and Gardens. Activities: County Longford Golf Club, one of the oldest in the country. An 18 hole Parkland course gives panoramic views of the surrounding countryside. Abbeyshrule Airfield - Pleasure Flights and Flying Lessons. Midland Karting & Paintballing Culture: Backstage Theatre, Oliver Goldsmith Trail, St Mels Cathedral, Caseys Bogwood Studios. James and Beryl Kearney’s lovely 1750s Georgian house just on the edge of Longford town was once owned by Lord Longford. It is set in four acres of beautiful wooded gardens, much of which have been designed by the current owners over nearly 20 years as a series of rooms, with many intriguing features. It really is a delightful house and has been sensitively restored with style, creating a very special away-from-it-all place to stay. The six guest bedrooms in the main house all have their particular charm (one is especially large, but all are lovely) and there are a several newer two-storey garden rooms, which are ideal for families, or anyone who enjoys having extra space. 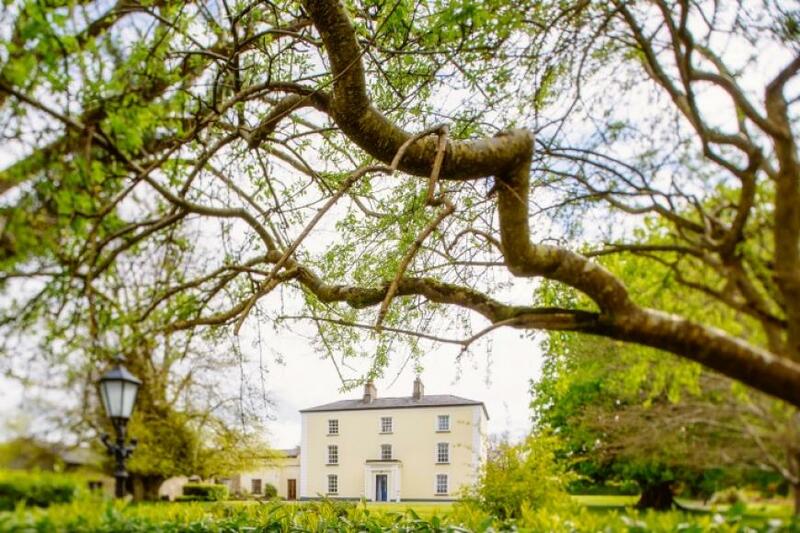 An elegant period drawing room is available to guests, also an impressive first floor library which has windows overlooking the gardens at both the front and the back of the house and can be used fro private parties. But perhaps the handsomest room of all is the unusual vaulted dining room, where an extensive (and very delicious) breakfast menu is served, setting the tone for the day. In its quiet way it's very evocative - how many breakfast menus lead off with a poem of times almost forgotten by a blind fiddler ('Raftery')? And every item on this neat little document speaks of the philosophy of this lovely house and its relationships with a network of special producers and suppliers in the surrounding area. Every detail of this unshowy meal is just right - and it's an experience that lingers in the mind. Viewmount also provides a great setting for VM Restaurant, which the Kearneys developed in characterful stone buildings alongside the house over several years and opened in late 2008 with well known chef Gary O'Hanlon, who established its early reputation - together they took the midlands by storm, making Longford a destination for food lovers throughout Ireland, and beyond. In converted stables, with exposed stonework and an abundance of candles making it atmospheric at night, the restaurant overlooks James’s fascinating Japanese garden and it is full of character. When beautifully set up with white linen, elegant white china and different flowers from the gardens on each table, it makes a lovely setting in which to enjoy classical modern cooking by Dutch chef Robert Groot Koerkamp, who came via Cliff at Lyons in Co Kildare to join Viewmount House in 2018. Whether entering from the car park or the main house, guests arrive in a ‘new’ bar and restaurant reception area with a welcoming fire, where Beryl explains the menu while you enjoy a pre-dinner drink. There's a great sense of place at Viewmount - the four-course dinner menu begins with an interesting cover note giving the history of the house, and then the menu itself reads like a who’s who of nearby artisan and specialist food producers, with names like John Stone beef (Longford), Thornhill duck (Cavan), Clare Island organic salmon (Mayo) – and, of course, VM’s own garden leaves and herbs - leaping off the page. As befits the surroundings, the tone of the menu is special occasion but - although cooked with creativity and finesse - the secret of VM’s success is that the food experience is built on respect for its clientèle, both locally and those who travel considerable distances for the pleasure of a meal here. Thus the cooking is grounded in the familiar products of the region, it is not overly cheffy, the atmosphere is welcoming and unstuffy – and prices are very reasonable for the quality offered. The half dozen or so dishes on each course may have a slight leaning towards poultry (duck, guinea fowl, free range chicken) but there’s plenty of beef, perhaps rare breed pork or Roscommon lamb, fish and shellfish on offer too, along with game in season and one or two imaginative vegetarian main courses. All the little niceties are observed, beginning with a complimentary amuse bouche (hoi sin duck in choux pastry, perhaps) before starters, which will include a flavoursome soup – VM vegetable soup, for example, served with basil oil and (very good) breads - and perhaps an interesting Taste of the Midlands salad, with O’Halleran’s free range egg, spinach, Kelly’s organic soft cheese, Rogans whiskey oak smoked bacon (from John Rogan, near Mullingar), capers, Viewmount herbs, red onion, red wine vinaigrette and roast pear. Main courses include the mandatory steak of course (28 day aged sirloin, for example, which may also be offered as a traditional roast for Sunday lunch) and there may be a special fish, such as line caught brill or cod from Donegal. Dishes sound intricate when reading the menu descriptions but skilful execution and care with balancing flavours ensures that the food on the plate does not seem too complex. Rather glamorous desserts are hard to resist - a Valrhona Chocolate & Rum Torte with Cherry & Vanilla Meringue, Raspberry Ripple Ice Cream and Hazelnut Sponge, perhaps, or a tasting plate of the highly unusual VM ice creams - and a carefully selected Irish cheesboard is served with an unsual fruit compote. Finally, to round off this special meal, coffee comes with lovely homemade petits fours. A meal here is sure to be a memorable experience, enhanced by attentive service and, especially, Beryl Kearney’s caring interaction with guests. An informative wine list, helpfully organised by style, includes some half bottles and a fair choice under €30 - also craft beers, including St Mel's, which is brewed in Longford. VM is a lovely restaurant, and well worth a journey. From Longford R393 to Ardagh. 1km, up sliproad to right following signs. Entrance 200m on right. Congrats James and Beryl on your award. Best Wishes from Angela and Carmel. (Railway Lodge) It's been too long since we last visited.